For all the innovative features an iPhone can offer there’s one thing it can’t do—it can’t give you that real desk phone feeling. Seriously, have you ever tried to hold your iPhone up with your shoulder while you type? Joking aside, the Desk Phone Dock saves you from needing more than one phone in your home office. 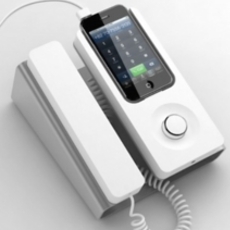 Taking a call by picking up a receiver feels more natural and less disruptive than hitting a button. It keeps your iPhone charged and includes built-in speakers, volume control, mute and a mic so you don’t have to clutter your desk with excessive accessories and wires.